Review: Excitement, drama, orphans and a murderer? These are all very important things in the book, Raven Summer, by David Almond. After an orphaned baby is found outside on a hill the story begins to tell of Liam’s epic life and adventure. This story takes place during World War II. 14 year old Liam and his friend are following a peculiar raven and stumble upon a child. They take her home and eventually she is fostered. While visiting the baby (named Allison by the foster family) Liam meets two other 14 year old foster children: Crystal and Oliver, who claims to be a refugee of war from Liberia. As Liam gets to know Oliver, he realizes how much a child can do to someone in the war and how much they can hurt other people. Later, Liam helps Oliver and Crystal run away because they are scared of Oliver being shipped back to Liberia. While they are on the run, Oliver reveals his true identity. Raven Summer always gives good detail and describes things so that there would be mental pictures in the readers mind. For example, “The night’s warm and still and the tent doors open. Bats are flickering against the sky.” The book also has a realistic plot that readers are able to relate to. Raven Summer also is an unpredictable book in a way that surprises you with the outcome very different than what you would expect. By doing that, the author makes the book much more exciting. I think the author wanted the reader to ponder how much the war affects children negatively. The book has unfamiliar English terms that makes it a little confusing and should be recommended for kids twelve and up due to mild violence and mild swearing. All in all, this book was sensational! If I were to rate this book I would give it 4 stars out of 5 stars. The author has done a very nice job with this book. I cannot wait for a new book by this author! I am sure, anyone who reads this book will like it as much as I did. We would like to thank Random House for providing a copy of Raven Summer for this review. 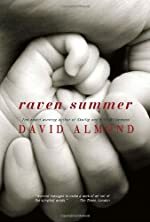 Have you read Raven Summer? How would you rate it?